Have you ever gone camping, at any time during the year, and spent the evening looking into your campfire, pondering the ways of the world? Then, after staring into the flames for a while, you leaned back and looked up into the inky black sky to discover you could see only a few stars? That was night blindness – a condition which rapidly dissipated as your eyes grew used to the dark – and you began to notice more and more “stuff” up there. Have you ever driven down the road at night, rapidly moving from very-well lit areas to relatively dark areas, and noticed that your eyes don’t adjust quickly enough to allow you to see properly? You simply flip on the bright lights, and go merrily on your way. Then, when you get home the motion detector over your driveway senses your arrival and pops on the floodlights over your garage, and you can see well enough to get into your house. You want to let the dog out into your back yard, and notice that it’s really dark back there – so you flip on yet another set of lights. What you haven’t noticed from all of this “convenient” technology is that all of these lights have also intruded into your neighbours’ houses, bedrooms, front porches and back yards, and disturbed their tranquility. You have potentially made them night-blind. Consider this: the burglar who is intent on entering your neighbour’s house was assisted by your garage light spillage, which created harsh shadows in which he could hide; your car’s bright headlights blinded the oncoming driver such that he didn’t see little Susie’s pet cat until it was too late; not to mention the skunk that was startled by your back-yard floodlights and just scuttled under your deck! As astronomers will be able to confirm, we have lost a majority of our night vision in most of the Western world to light pollution. We happily light up our houses with super-bright spotlights in order to “show them off” to the neighbourhood. Industrial corporations, such as factories, trucking yards, car lots, fast-food restaurants and retail/theatrical “razzmatazz” Grand Openings are also guilty of lighting up their areas excessively. What we’re all actually doing is wasting electricity. In most of North America and throughout all of Europe, light pollution has reached proportions where one cannot see the Milky Way any more. Maybe 100 stars and planets can be seen in cities on a really clear night. Even in the country, you cannot see as much of the sky as you used to, simply because of reflected “skyglow” – that phenomenon created by the extreme amount of light thrown up - and therefore, wasted - into the sky by our cities. If you drive your car in the country at night, pull over safely, get out of your vehicle, and take a long look at the horizon around you. When I do this in my area of Southern Ontario, I can easily identify what town is where, or how close I am to the nearest casino by the sky-glow. 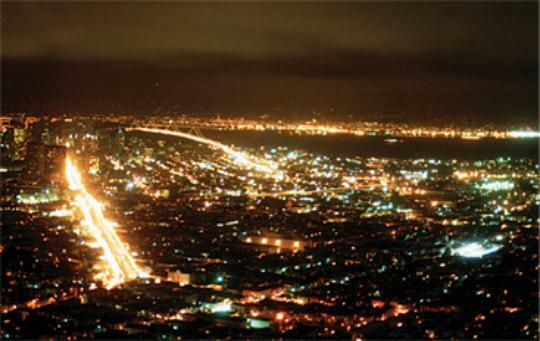 Above is a picture, taken a few years ago, showing San Francisco at night. The result is staggering: the Northern Hemisphere of this planet is an almost total disaster area of light pollution! Studies have been conducted which show that the migration patterns of birds have been seriously affected by light pollution. As an example, flocks of night-flying birds have flown at full speed into brightly lit office buildings, because they have been confused by the intensity of the lights. There is also documentation of trees growing in weird ways, due to intense nearby light. This is not a difficult problem to conquer. Collectively, all we need to do is turn off one light, redirect necessary lighting properly, eliminate unnecessary lighting and stop wasting our resources by putting lights where they don’t belong. We’ll all live better – and so will the birds!